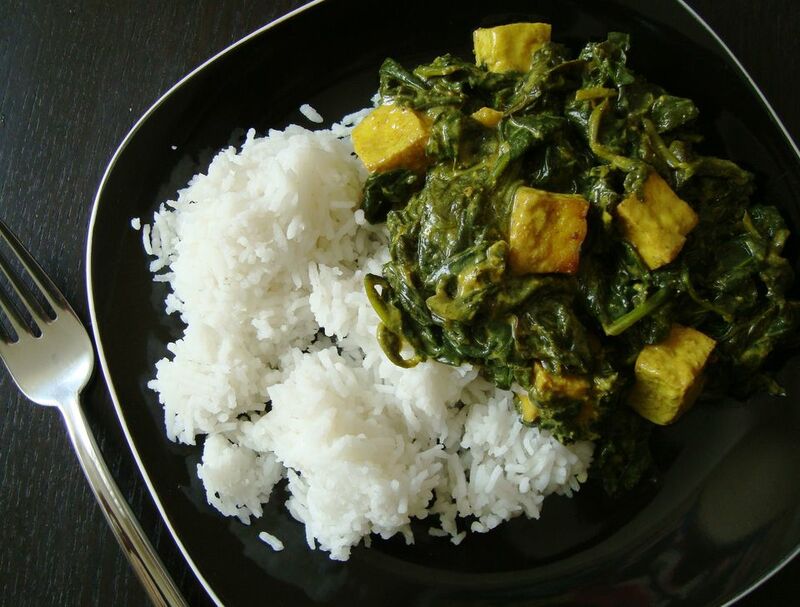 Traditional versions of Indian palak paneer (creamy Indian spinach with cheese) and the similar dish of saag paneer are made from a soft cheese that is not aged, called paneer. For home cooks in the US, many westernized versions of this recipe use ricotta cheese for a reasonable fascimile in place of the paneer cheese. This vegan and gluten-free recipe for Indian palak paneer, however uses tofu instead of paneer, for a completely dairy-free and vegan dish. Palak paneer is also very similar to saag paneer, another Indian restaurant favorite, particularly for vegetarians. This recipe is vegetarian, vegan and also a completely gluten-free and vegan dinner. First, drain and press your tofu well. Not sure how to do that? Check out this step by step guide for how to press tofu. Once your tofu is drained and pressed, slice it into about 1-inch (bite-sized) cubes. Now you're ready to go. Sautee tofu and garlic in two tablespoons of olive oil until tofu is lightly crisp on all sides, about 4-5 minutes. In a separate large skillet or a wok, heat the other tablespoon of olive oil. Add the curry powder, turmeric, ginger powder and water, then whisk in the non-dairy yogurt. Add the spinach, stirring to cover in the yogurt sauce. Depending on the size of your pan, you may need to add the spinach in batches. It cooks down quickly, so stay on it and keep adding more as quickly as possible to ensure a relatively even cooking time. Once the spinach is fully cooked down, remove the pan from heat and process the spinach mixture in a food processor or blender until almost creamy (an immersion blender will be useful for this step, if you have one) or until it has a nice texture, keeping in mind that some more moisture will be absorbed as it cooks and cools. Return the spinach to the skillet and add the sauteed tofu. Cook and stir until the tofu is well mixed with the spinach and the dish is completely heated through. Serve your vegan palak and tofu dish along side plain steamed white or brown rice, or, mix it up a bit and accompany your homecooked meal with another whole grain, such as quinoa or your favorite ancient grain.